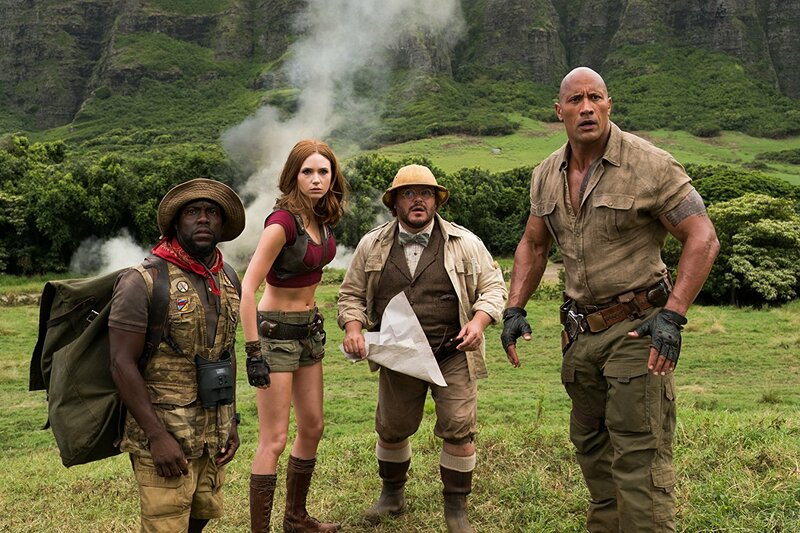 It’s probably giving the makers of Jumanji: Welcome to the Jungle too much credit to note that a film whose premise revolves around kids magically occupying adult bodies includes a brief appearance by the son of Tom Hanks, the star of Big almost thirty years ago. That said, this sequel—undoubtedly named after the Guns N’ Roses song once the producers obtained the rights to play it over the closing credits—is a lot like Colin Hanks: a capable progeny that nonetheless pales in comparison to its popular predecessor. The Jumanji board game in the 1995 film, which starred Robin Williams, is replaced with an Atari-esque video cartridge, exhumed by a quartet of high schooler archetypes doing detention: Spencer (Alex Wolff) is the nerd, “Fridge” (Ser'Darius Blain) is the burly jock and Spencer’s sometimes pal; Bethany (Madison Iseman) is the pretty, solipsistic It girl who is emotionally attached is nothing except her cell phone; and Martha (Morgan Turner) is the brainy bookworm. Unlike the 1995 original, where the game’s contents were unleashed into the real world, here the teens are teleported into the Jumanji video game, where each is assigned an avatar. Spencer is a strong, speedy explorer name Dr. Smolder Bravestone, played by Dwayne Johnson. “Fridge” is reduced to Bravestone’s diminutive sidekick (Kevin Hart), with a penchant for zoology and a weakness for cake. Martha becomes a comely commando (Karen Gillan), while Bethany becomes Professor Sheldon Oberon (Jack Black), a portly cartographer and, well, man. Most of the chuckles come compliments of the age, gender, and persona-swapping gags. Johnson is convincing as a young nebbish suddenly coping with the body of a muscle-bound hero, while Jack Black exudes the superficial silliness of a self-absorbed teen girl. Hart is hilarious as the BMOG suddenly cut down to size. Even Nick Jonas pops up as another kid caught in the game to demonstrate that, indeed, Nick Jonas can carry a role. Still, the premise and set pieces are uninspired and instantly forgettable. Any sticky situation is quickly resolved, and any sense of danger is minimized by the multiple lives each player possesses, a la a video game. Moreover, the film needlessly sacrifices its PG-rating for the sake of stray profanities and sexual allusions scattered throughout, particularly revolving around Bethany’s male anatomical self-discovery. Whatever marginal comedic value these off-color moments hold don’t befit the wide target audience for a holiday season release. The camaraderie between the characters and cast carries the film. Otherwise, while the original Jumanji sprang on a fictitious board game, Jumanji: Welcome to the Jungle is more of a bored game.